The STEPPIR vertical comes in two sizes depending on if 40M is required. 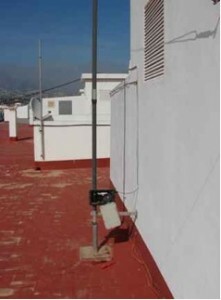 The larger being the 40M antenna at 10.5 metres height, known as the BigIR and the 5.50 metre version known as the SmallIR. These antennas are electrically tuned using a bimetallic strip that is sent up and down the inside fibreglass tube until the correct length is achieved according to the controller. The controller is unusual in that power is maintained to the antenna even when switched off as this is the only way that the controller knows at what position the antenna is tuned to when turned on again. You can recalibrate the antenna which pulls the strip fully in and resets the stepper motors if in doubt. Most verticals require a set of radials to tune the antenna on the frequencies being used. The SteppIR is no different and plenty of help is available in making sure this is carried out satisfactory. I live in Spain in a top floor apartment with access to a large flat roof. Unfortunately the roof is also used for hanging out washing so it is not possible to lay out 100 or so radials across the walking area. To get around this problem the antenna is situated next to the lift block and radials placed around the lift block just above the roof. In practice this has an effect of detuning the radials which are against each other so the MFJ antenna analyser was used to cut the wires to tune within the operating frequency. In most cases the length was found to be shorter than expected. The roof has almost certainly metal sheeting under the concrete so there is some ground plane to work against. When I moved from my house in Spain to the apartment my ability to work HF went down to nothing and I only attempted to solve the problem recently when I White visited and we spent time trying to fathom out the problem. The tuning just seemed too flat and despite several attempts to address the problem the best operating results were only on the highest frequencies. I then left the problem until very recently when I decided to really look into why the tuning was so bad. I started with checking that the controller was in fact operating. You have to be careful as the stepper motor drivers are not buffered so any shorts etc and they blow and are very difficult to replace being surface mounted (they have since put these in sockets). The voltages looked ok and a quick dash to the roof when I started a recalibrate soon showed that the stepper motor was moving. However placing the MFJ antenna tuner onto the coax I proved that no SWR change was occurring indicating that there was either a coax problem or something else. I cut-off and remade the coax cable ends and tested with out any load and with a 50 ohm termination which proved that all was ok. I then retested placing the SteppIR into a high band which tuned poorly; at anything lower in frequency it showed no change.